Giving plants their green color is a natural compound known as chlorophyll. Utilizing light energy to convert water and carbon dioxide to glucose, chlorophyll plays a vital role in plant energy production. Research has found that this substance not only sustains plant life but has profoundly beneficial effects on human health as well. The molecular structure of chlorophyll is very similar to that of hemoglobin, the substance that transports oxygen in the bloodstream. Consuming chlorophyll rich fruits and vegetables improves the efficiency of oxygen transport in the body, which works to thin the blood and, in turn, helps prevent clotting and heart disease. Taking chlorophyll enhances any exercise program because the body requires oxygen to develop muscles and burn fat. Chlorophyll exhibits strong anti-inflammatory and anti-viral activity and serves as an effective chelation agent, removing toxic heavy metals such as mercury from the body. Studies have observes the ability of this substance to aid in the prevention and treatment of cancer. Due to its antibacterial properties, many individuals with bad breath and body odor use chlorophyll mouthwashes or baths for relief. 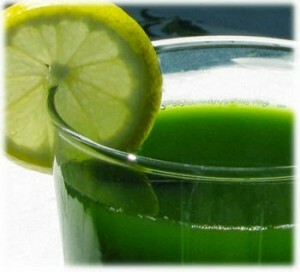 As with other beneficial nutrients found in whole foods, juicing maximizes the absorption of chlorophyll. Some of the best sources of this rejuvenating substance including asparagus, romain, collard, swiss chard, arugula, bok choy, barley grass, chlorella, collard greens, kale, leeks, parsley, spirulina and wheatgrass.